The spiritual beginning of our Camino walk was in Lourdes. We had one day there to pray, attend masses and be immersed in the profound and powerful presence of God. This was our first stamp in our Camino passport. The pilgrimage was under way. 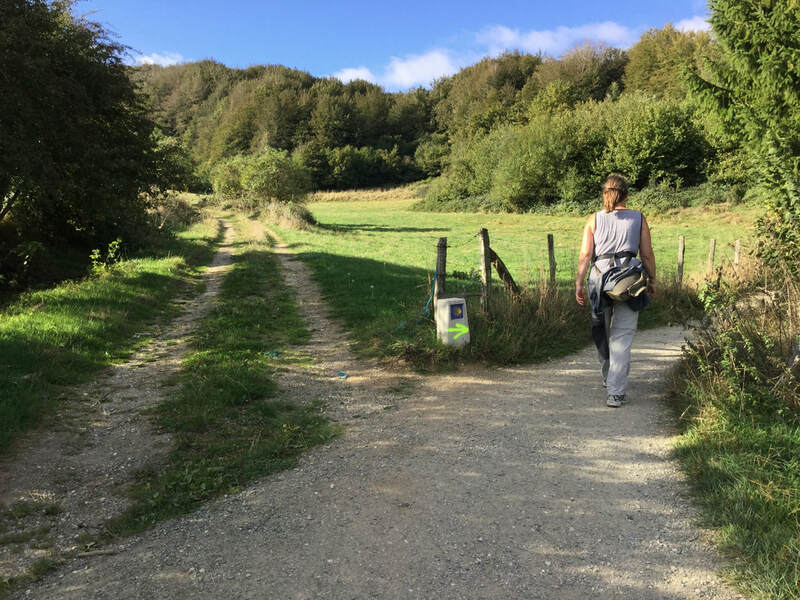 The first day was a long walk over the Pyrenees from St. Jean Pied de Port in France to Roncesvalles in Spain, total of 28km. At the 8km mark was a pilgrims hostel, then at 20km was a water tap. This day of walking separated us from the bustle of the world and left us alone with our thoughts and prayers as we walked through the beautiful mountains. Many of the trails wound through country lanes or across open pastures. At every junction we had to look for the shell sign or an arrow to get us on the right path. There was a beautiful solitude we experienced in the prayful rhythm of walking hour after hour. 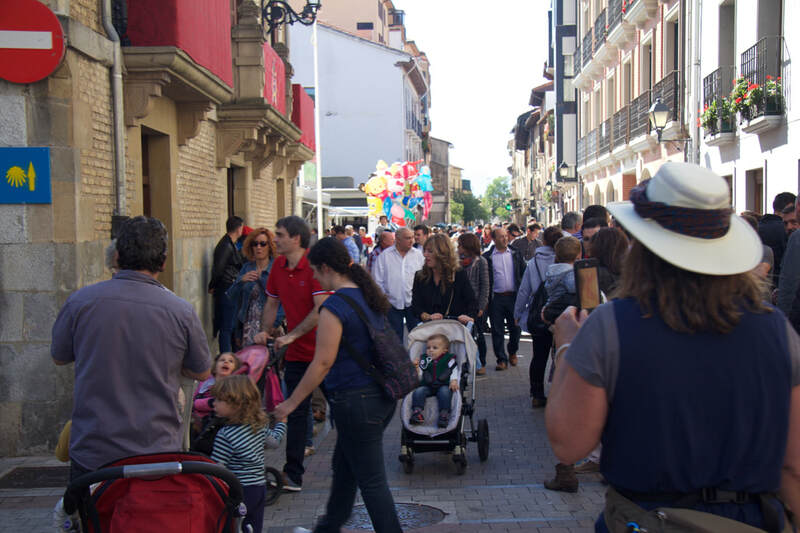 As we entered a large town we passed through a boisterous street festival. Everyone was laughing and happy. There were balloons, costumes and carnival rides. This was a moment to celebrate the joy of living. Although we were never sure what the festival was about we celebrated with gelato cones and kept walking. On the left edge of the picture is a Camino sign. We were still on the right street. 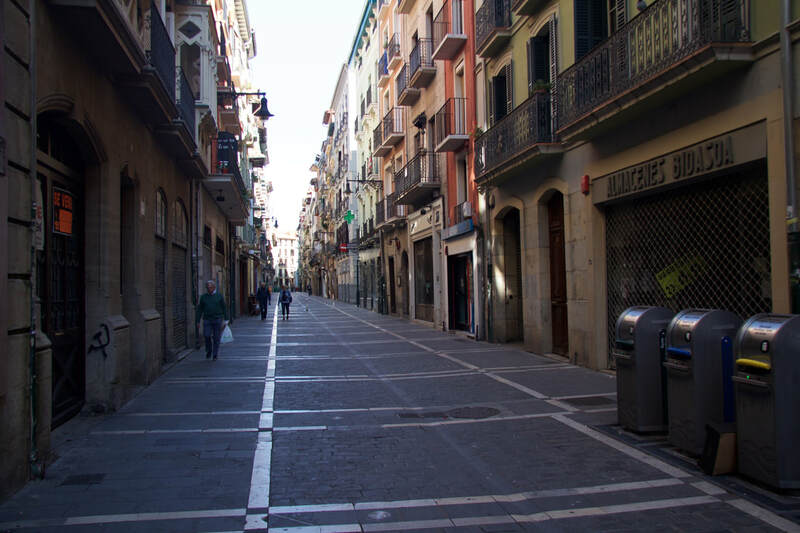 Pamplona was one of the largest cities we stopped in. It felt strange to be back in the bustle of shopping and traffic along the main roads. We ate supper in the same restaurant as a number of other pilgrims. We shared the bond of walking pilgrims with voracious appetites. Our every moment together was important as we would probably never share a meal with these people again. We parted the meal wishing each other Buen Camino (good Camino). 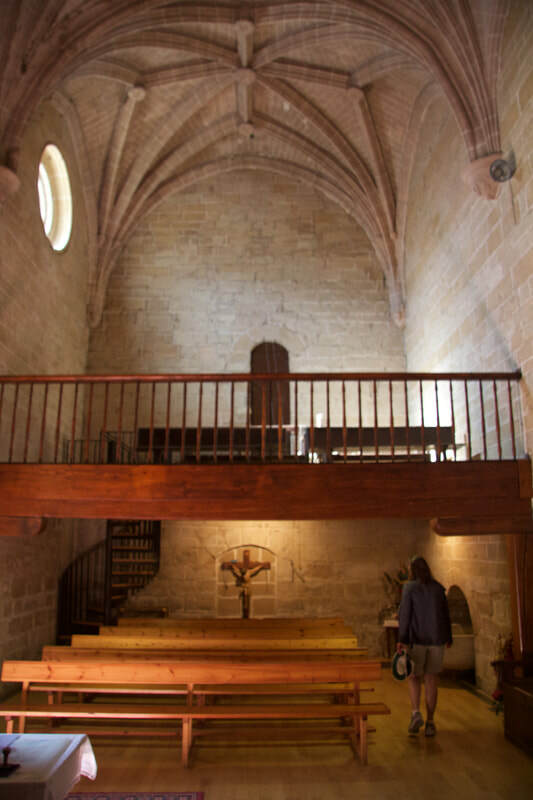 There were many small chapels and churches open along the way. Often we would be the only people there. These were quiet intimate moments of prayer for our journey, our families, friends and the world around us. 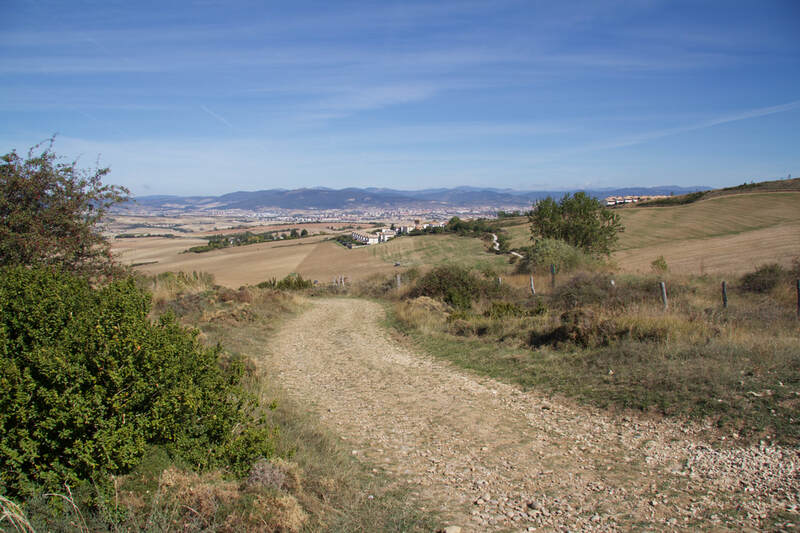 After Pamplona the Camino trail moved into open rolling farmland. We could see for many kilometres in every direction and it seemed like our walking never got us anywhere. This day it was not easy to just keep walking. The spiritual journey is not always an easy one. 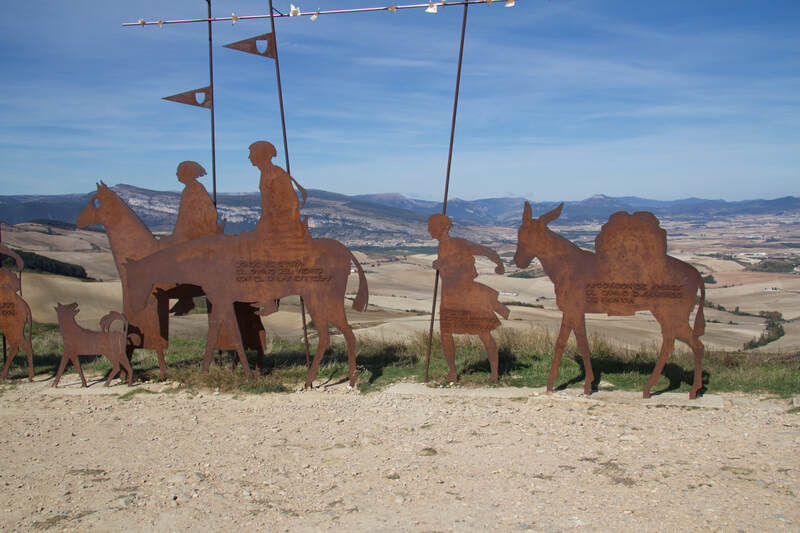 At the top of the ridge we saw these amazing pilgrim statues. We stopped to admire the view rolling away in every direction. What came next was a very tough downhill walk along a path of rough rock and loose gravel. Our feet were finished well before our walk this day was done. We might have quit early but we were in the middle of no where. Just a few more steps and then a few more and give the challenge up to God. We passed through several small hill towns. Finding the trail took a sharp eye. By now we were used to the rhythm of walking each day. Up early for breakfast. Eat, pray, walk, and work up an appetite for supper. The many little things in each day were blessing from God. The sun, beautiful land, people we met and the tremendous spiritual journey Marie and I were sharing. Sometimes the walk was along highways and busy streets. 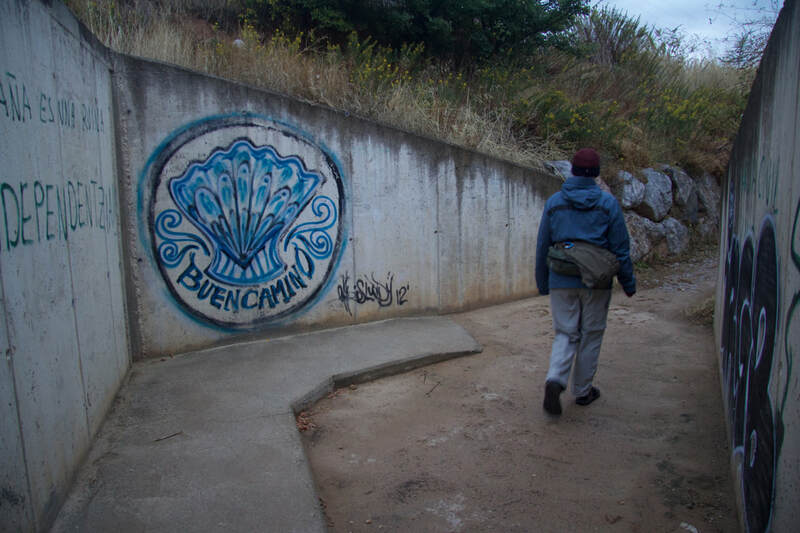 Even here the graffiti wished us a good Camino. How much are we supported by people we never meet? We are blessed to be a community in Christ all over the world. 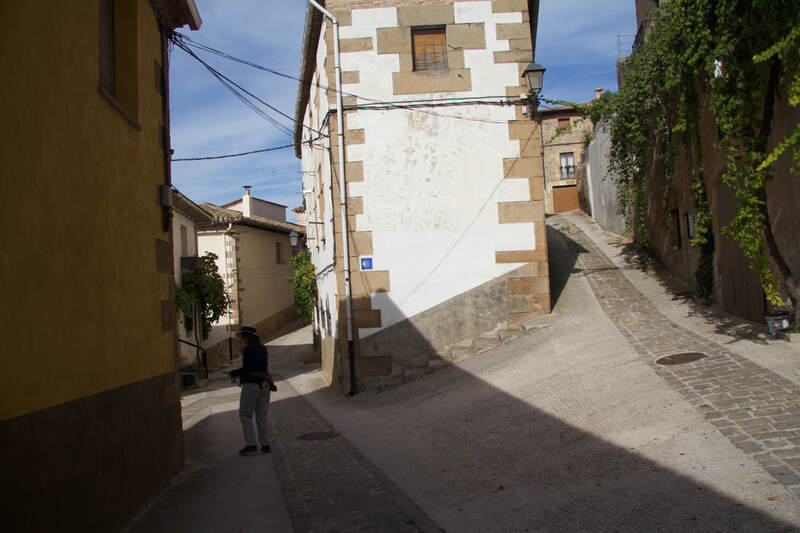 Logrono was the end of this ten day leg of our Camino. 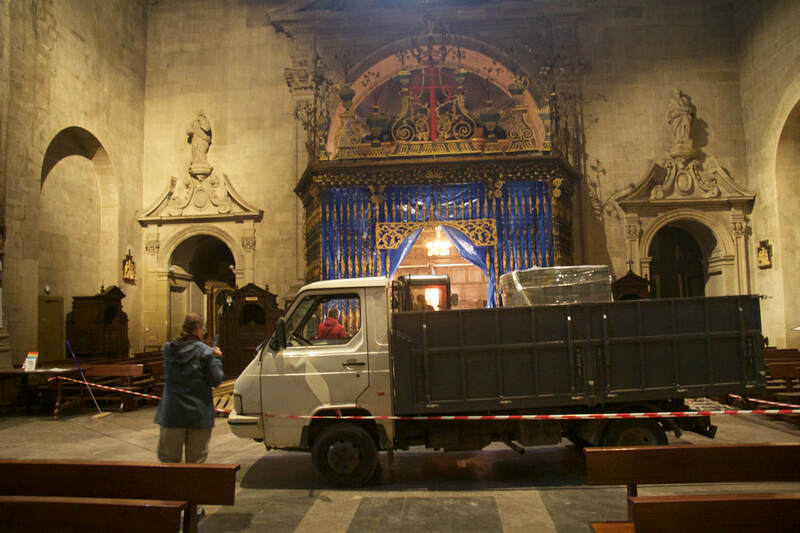 We stopped to pray at the cathedral were a little work was being done. We celebrated and bought new runners. The next day we got on a train to Avila to see where St. Teresa was from. At the train station a number of pilgrims got off the train to begin walking the Camino. Marie and I almost got off the train to continue our pilgrimage. We had covered 250km with only 500km to go. Next time!